Serious about Skyrim? You need Skybird. 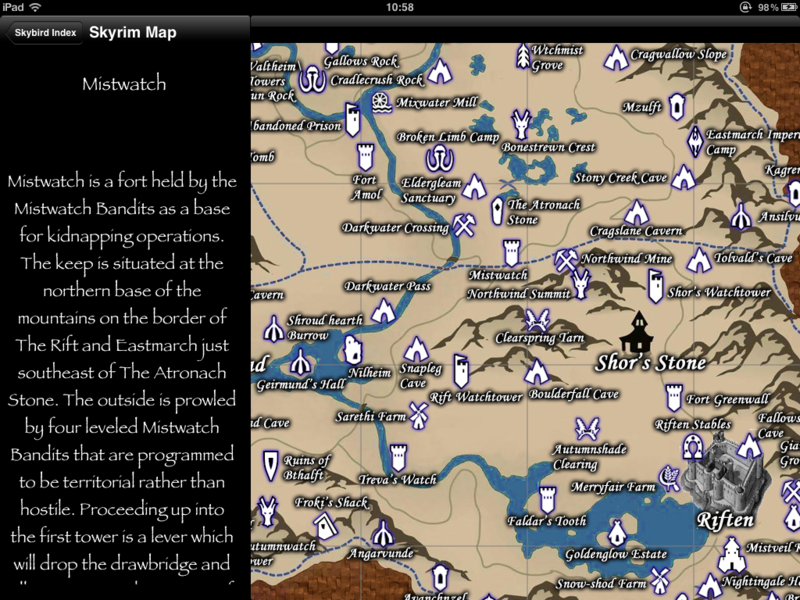 Skybird HD contains a fully-interactive Map of Skyrim, one of hundreds of different references in the App. Skybird is an amazingly detailed reference and gameplay App for Skyrim. Skybird takes your experience within Skyrim to the next level, with thousand’s of different Spells, Weapons and Armors included, with full Potion mixing and Ingredients Analysers. And a fully-interactive map of Skyrim. Skybird and Skybird HD is available on the Apple App store for iOS platforms. The links in the menu bar above will take you through all the features of Skybird on both platforms. The video page shows Skybird in action. Skybird has taken hundreds of hours of development to aspire to the the best, most complete, detailed and fun application for Skyrim. I am certain it will help you to get the most out of Skyrim. Massive changes make squeezing in previous games’ baggage difficult. Attacks that took down Dyn appear to have been “rented” from multiple botnets. Don’t panic, you are not going mad – there is nothing wrong with your App Icon size – this is a bug as a result of the Lion update. To fix it, download the latest version of the Application Loader from here. Once it has downloaded, quit Xcode, install the new Application Loader as normal. Restart Xcode, and generate a new archive for distribution. When you validate this new archive, all should be well.